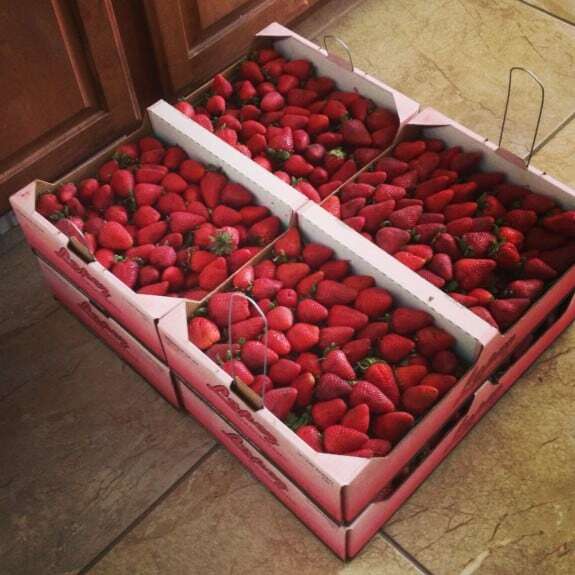 A few weeks ago I was about to leave to take my son to preschool and my sister showed up to deliver me some strawberries I had ordered. I had COMPLETELY forgotten that I had ordered them and that they were being delivered that day. These were local Organic Strawberries and when they were delivered were completely ripe and needed to be used within a a day or two. I really wanted to do some freezer jam out of them, but I wasn’t sure I was going to have the energy. So, being that we make a lot of Smoothies, I decided to do some of both! 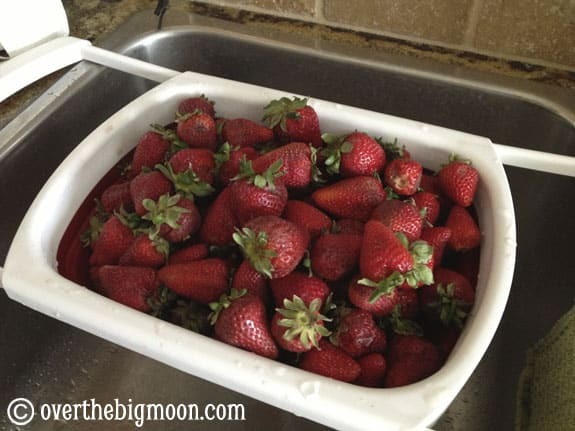 Start off by washing the strawberries good! 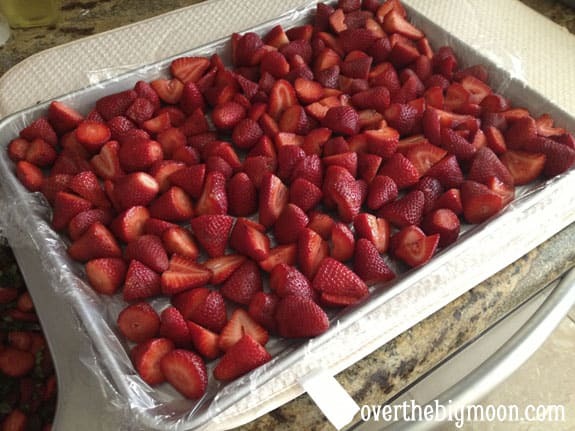 Cover a pan in plastic wrap and then lay out your strawberries in a single layer. I’ve tried other liners to cover the pan, but I’ve found that they stick the least to plastic wrap! 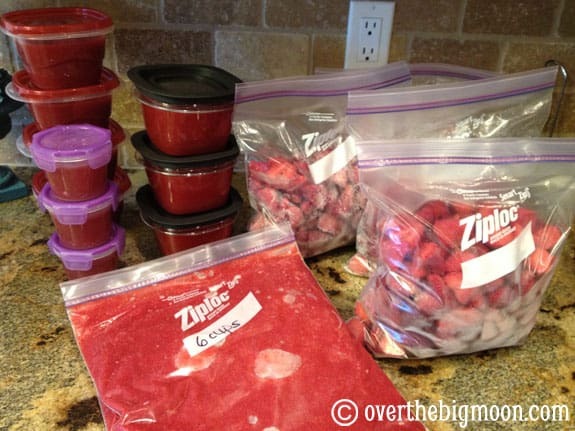 Put in the freezer for a minimum of 1 hour up to overnight! I usually just do mine for a couple hours. 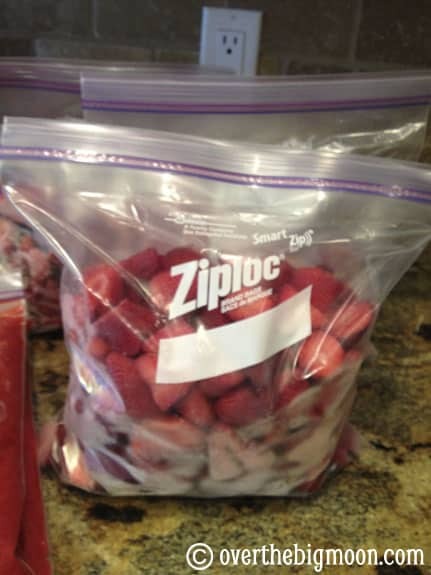 Then, divide them up in Freezer Ziplocks and Freeze away!! 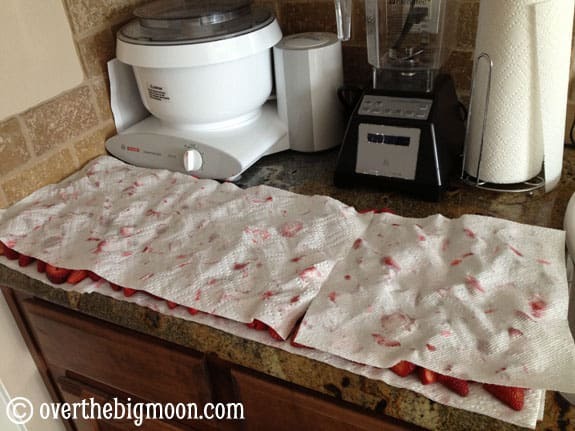 The day I was going to go freeze the strawberries I woke up and one of the blogs I follow daily, Food Storage Moms, had posted this NO SUGAR – NO PECTIN Freezer Jam Recipe. One of the reasons I wasn’t sure if I wanted to tackle Freezer Jam, was because I knew I did not want to use the recipe I had made in the past that used an extreme amount of sugar. We have really been trying to eat smarter in our home – and the regular freezer jam recipe was not that. I hadn’t prepared to make any Freezer Jam, but this recipe only uses the Strawberry Puree, Honey and Lemon! Only 3 ingredients – sign me up! And, I had everything I needed on hand! So, I dug through my tupperware cabinet and fished out a bunch of random some containers I could use to store the jam in! For the full recipe and directions – head over to see Linda’s tutorial HERE! 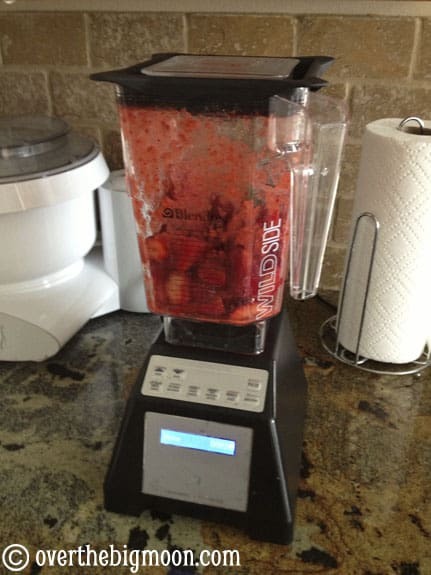 With my last 1/2 of crate of strawberries I decided to just puree the strawberries, so that next time I needed to make my family some Jam I would have the strawberry puree all ready! So, in total I ended up with 4 Gallon Ziplock Bags of Frozen Strawberries, 2 batches (12 cups) of Strawberry Puree and 7 pint containers and 3 1/2 pint containers of Jam . Not bad for a few hours work! Again, a major thanks to Food Storage Moms for the awesome Jam recipe! I’ve been super super happy with it and my kids have totally loved it! How long can the jam be stored in the freezer before it goes bad? I definitely want to try this recipe! This is my first time making this specific recipe – so I am not 100% sure. But, my assumption would be 6 months in a regular freezer and 1 year in a deep freeze.